UCAN TORPEDO™ is an excellent anchoring alternative for medium duty and temporary applications. With its corrosion resistant, mechanical galvanized, finish UCAN TORPEDO™ is also well suited for outdoors. 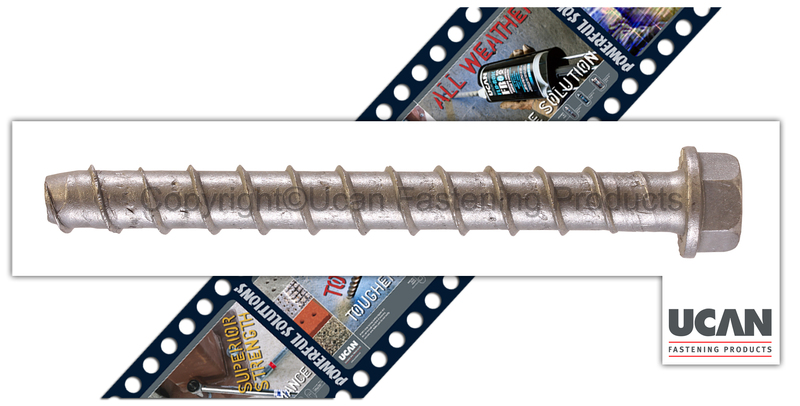 Matched with a standard UCAN ANSI - tolerance drill bit, this fastener produces consistently high load values. UCAN TORPEDO™ installs quickly leaving the clean appearance of a finished hex washer head on the working surface. For superior corrosion resistance, bimetal 316SS TORPEDO™ GOLD TIP ANCHORS are now available. Not recommended for installation into uncured concrete (less than 7 days old). Part No. Size Pkg. Qty. Case Qty.